Sometimes a bite-sized sci-fi romance can deliver big taste in terms of themes and/or social commentary. 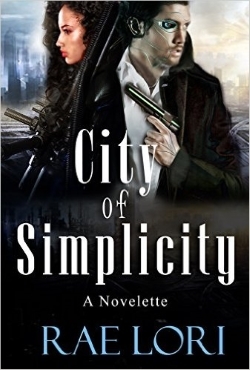 Rae Lori's CITY OF SIMPLICITY accomplished that for me, and I'd like to share a bit about why. Citizen 52701 once had a life that is now a distant memory in her dreams. All that remains is the name she carried over from the time before the change: Lyn. As a by-the-book law enforcer of a newly controlled futuristic society, everything is available at one's fingertips. Except the one thing that matters most of all. A renegade is on the loose, moving amidst the shadows to stay alive. His one goal is to find the wife he lost when the change took over the city. The problem? She is one of the enforcers eliminating renegades trying to escape the system's control. He'll risk everything to try and bring her back to him. No matter who or what he has to take down to do the job. City of Simplicity is an 11k bite-sized romantic sci-fi novelette. Short enough to consume on your coffee or lunch break! CITY OF SIMPLICITY features a dystopian setting. The government and media maintain an ever-watchful eye over the populace. Everything is regulated, including fashion. Another example is that the heroine takes Emotin, a medication that dampens emotion and "irrational thought". Her occupation practically demands it in order for her to cope. She helps keep the order, but at a cost. This city's veneer of peace masks an underbelly of oppression. This story explores the role of an all-powerful media in the characters' lives and what can happen when that role expands too far. This theme resonates with real life issues and prompted me to reflect upon how we're far too trusting of the media. We're often too complacent to demand greater transparency from the media, or to question its often biased way of disseminating information. CITY OF SIMPLICITY takes media influence to an extreme in order to examine the cost of such blind acceptance. In some ways, we're not that far away in real life from how the media is portrayed in CITY OF SIMPLICITY. The romance is one of reunited lovers and features an interracial romance. Because of the short length, the romance is slight. On the surface, it offers a rescue fantasy, but it really goes much deeper than that. CITY OF SIMPLICITY's main reward is a social justice fantasy delivered through the lens of a futuristic romance. I love that the character who rights a social wrong represents those who were responsible for the problem in the first place. In other words, the story spins a tale about a representative perpetrator taking responsibility to fix a broken society, rather than placing that burden on those who have been oppressed. It made for an emotionally satisfying ending. I was glad of the opportunity to reflect on the themes the story presented, especially since they related to a few current events (at least, here in the U.S.). I'm not sure if that's what the author intended, but it's what I took away from the story. I enjoy SFR for its escapist value, yet I still seek meaningful content that I can reflect on after the story ends. And like other busy moms, sometimes a short SFR meets all my needs when my schedule needs it most!